With spring behind us, there is no better time than now to revamp your bathroom to match the brightness of the outdoors. It is so easy to change the whole look of your bathroom without putting in a lot of time or money. First, choose a color palette -- or if you’ve found a fabulous shower curtain base your color selections around that -- but you should have an idea of what you are looking for before you start. Give your boring bathroom a facelift with any of these fun and fresh bathroom staples or accessories below. Just click the underlined words for more options. Shower Curtains -- If you have a shower you should own a shower curtain; this should be obvious. However, changing your shower curtain is a quick, easy and cheap way to change your entire bathroom! Don’t forget to purchase a lining for your shower curtain so that your floor won’t get soaking wet each time you bathe. Shower Curtain Holders -- You may not have even known that there is a whole world of possibilities when it comes to shower curtain holders. 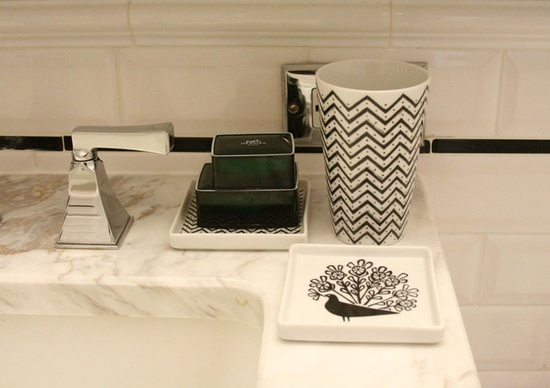 This is another inexpensive accessory that can make a dramatic change to your bathroom. Bath Rugs & Mats -- If you are unsure when you purchased your bath mats it is most likely time to replace them, especially if they no longer absorb water and constantly stay soggy. Buying a larger mat is a fantastic option if the tile floor of your bathroom is an eye sore. Countertop Accessory Sets -- It is time to actually buy a toothbrush holder; unfortunately we have outgrown the age of simply putting them into any old cup. These are rarely expensive and usually come in a collection with other organizational accessories to put Q-tips, makeup and other bathroom necessities. Now all of your belongings will actually have a place of their own, and it won’t look cluttered or messy. Over the Head Shower Caddy -- This is a great purchase for those of you who share your bathroom. It allows for more storage in the shower for everyone’s face wash, razors, shampoo, conditioner and more. Now you won’t have to fight over whose items can actually fit into the shower. Over the Door Hangers -- Optimize space with an over the door hanger; it will leave you and your roommates a place to put towels, robes or shower caps. It also provides a good place to let your towels dry. Plus you can make sure that you each have your own hook to prevent any mix ups. Stackable Drawers -- Stackable drawers are also a good option, if you have room for it, especially the kind that have wheels on the bottom which makes it very easy to move. Get a drawer for each person that uses the bathroom for items too large to fit on the counter/sink. Trash Can/Toilet Brush and Plunger -- An obvious, but very important bathroom staple for ladies. With so many options available, you can really customize your trash can to seamlessly fit any style. In the same vein as trash cans, do not forget to purchase a plunger and toilet brush. To not draw attention to them, place the toilet brush/plunger right next to or behind the toilet. Any or all of these pieces will help transform those old and tired bathrooms into a sleek and unrecognizable space. With one or more of these changes you will have your bathroom looking as good as new in no time! If you find anything especially cool/fun feel free to share below; we look forward to hearing from all of you! Got some antic ideas. Creative accessories can make the bathroom exclusive and unique. There are lot of options available for us we just have to use the right one according to our demand. starceramics.com.au can offer us some great accessories ideas.